Solutions Review’s latest Endpoint Security news website adds to the cyber security suite covering news and best practices alongside the identity and access management and security information and event management news sites. The new site provides buyers of information technology solutions with everything they need to make informed decisions when purchasing Endpoint Security solutions. 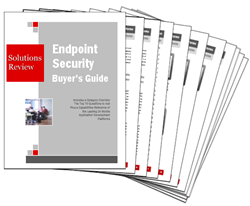 Solutions Review, a leading online resource for enterprise information technology news and best practices, announces today the release of the Endpoint Security news website and the 2016 Endpoint Security Solutions Buyer’s Guide. Developed by Jeff Edwards, Solutions Review Cyber Security Editor, the guide is a compilation of the top 24 solution providers offering endpoint security and protection solutions. Solution Review’s latest buyer’s resource provides 24 detailed profiles for each provider included in the report cutting through the rhetoric to provide an unbiased rundown of unique and key product features. Coupled with endpoint security market overviews and 10 key considerations the profiles aim to illustrate company objectives and background in a snapshot, and unearth the technical capabilities of each endpoint security and protection product and service. The top 24 endpoint security and protection solution providers detailed in the report include: Bit Defender, Carbon Black, Check Point, Code42, Comodo, CounterTack, CrowdStrike, ESET, F-Secure, FireEye, ForcePoint, Heat Software, Intel Security, Kaspersky Lab, LANDESK, Microsoft, Palo Alto Networks, Panda Security, RSA, Sentinel One, Sophos, Symantec, Trend Micro, Webroot. In addition to the 2016 Endpoint Security Buyer’s Guide, industry news, endpoint security best practices, industry events, presentation and demo videos, Solutions Review is also host to the new Cyber Security Week in Review video series. The new video series aims to recap the most important and impactful news, updates and best practices happening each week within the cyber security space. These quick and easy to digest video recaps can be accessed through the website itself as well as Solution Review’s YouTube channel providing visitors with another resource to help stay abreast of all things cyber security during purchase, implementation and maintenance periods. With the release of Solutions Review for Endpoint Security, cyber security coverage has come full circle. Visitors can now utilize Solutions Review as a single destination for all news, updates and best practices across identity and access management, security information and event management and endpoint security. IT professionals interested in purchasing solutions to address cyber security needs have access to all information hosted on the sites at no cost. With the release of the endpoint security website and 2016 Endpoint Security Solutions Buyer’s Guide, Solutions Review is continuing to become the best resource for all thing cyber security. Solutions Review is a collection of online news sites bringing the latest technology news, opinions, social media, best practices, videos and industry events together in one place for our readers with a strong focus in the Enterprise Mobility, Big Data, Data Analysis, Identity Management, the Cloud, Data and Cyber Security. Solutions Review is managed by a team of content experts and features original insights along with a thoughtful aggregation of industry best practices and solution news. Solutions Review allows seekers of technology solutions to make thoughtful and informed decisions.